in the Riley Blake booth. Cindy and Jina will be setting it all up for me! go over and visit them. Bake Sale goodies so I can see what they look like in Portland! could be used for many other things. and four vintage JELLO molds. and one of them is this giant dresden. it fits inside the giant dresden perfectly! I have used all 3 of my rulers to make potholders. these are fast and easy potholders to make. All you need are three 10" squares and the Hexie Half Ruler! cracker jars available at Walmart. I am also doing a cookie jar! Don't you just want a a real pot of tulips on your kitchen windowsill? that I told you about in my last post. you must wear a cute apron! but I have been designing so long that everything old becomes new again. and I like my aprons with nice deep pockets. because it's so simple to make! It takes a combination of 1 1/2 yards of fabric to make. snapped pics of them in the backyard. Can you see the half circle tab sewn into the waistband? It's for holding a dishtowel of course! I made it for my kitchen table but it would be a cute little wallhanging too! in Las Vegas this September. everything together to get sent off. this would be the last quilt to hold up! in my flower beds like I am trying to do. I havn't tended to my garden yet. as soon as my patterns are all written!!! I finally got a good nights sleep last night for the first time in weeks! Very Cute! I love so many of them it is hard to pick my favorite. Great Job :) Don't ya just wish there was more time in a day so that quilting and other things all got finished, lol. So no judgement here concerning the garden. Amazing, I need them all and the patterns. I made the tulip blocks from the row along into a table topper for a gift. 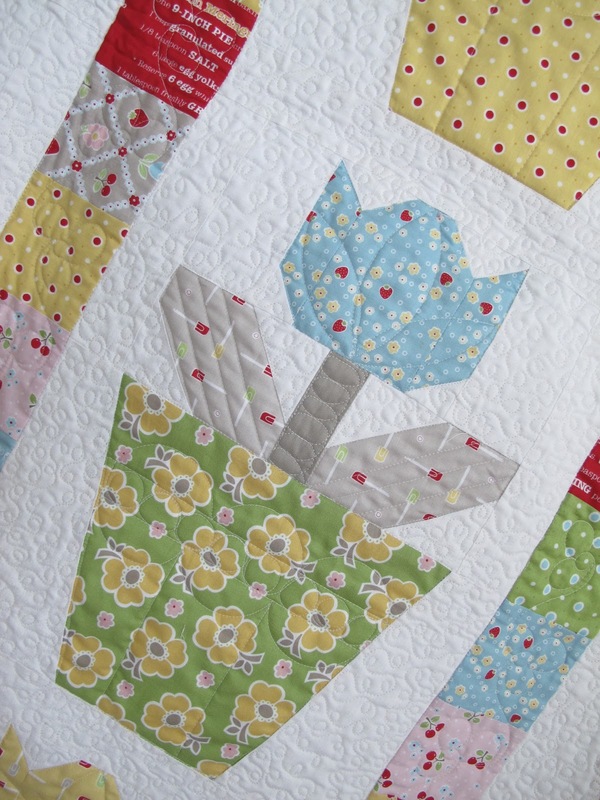 I had been figuring out a quilt with tulips in pots standing on a wall behind a garden bed full of flowers. Well now it is closer thanks to these new patterns. oh my goodness, wonderful wonderful! My kitchen is all cherries so I do believe my table will need one of your quilts too. And the aprons. Heavens. Every girl needs at least a dozen of those. Great job! Everything is adorable (as usual)! I love Bake Sale! You are just the best designer ever! oh, wow Lori! Love your new line and all of the fun patterns. You will be a BIG hit (again!) at Market. Love them all! Ps. I just had to go back through again!! Your quilts are adorable and canister covers! Oh my!! I love all your new fabrics and of course all your cute patterns. Just in case you forgot. Every single piece is stunning! I just can't believe your talent! Thank you for sharing with us. MAJOR love coming your way! I love them ALL! I have all the rulers .....I'm ready!! You're just amazing Lori. Now you have caused a buzz in my head with all these lovely ideas and projects. (But first I think I need to buy more material). My favorite is the 'dresden' quilt made with your Thimble Rulers. Your creativity knows no bounds! Each pattern is cuter than the next! Very adorable quilt holder, mine just returned from college for the summer. I absolutely love the canisters. I can't wait to make a set for my kitchen. They will go perfectly with all the things I have made from my Sew Cherry fabric. Love them all! I have a bundle of Bake Sale sitting in my FQS shopping cart now, waiting for the next pay day! I can't tell you how much I am in love with the Mixing it Up quilt! I am also in love with the Canister set :) I just love all your ideas! Cute cute and more cute!!!! I love each and every one of your projects! Oh my gosh! I've been dying to order Bake Sale for our kitchen, but now I think I might have to wait a little bit, so I can order enough to complete these adorable patterns you are releasing!!! Please don't forget to share with us where you purchased your feedsack towels from. I would love to order some, but I worry about quality. I can't wait to make our kitchen look oh so very cute!!!!! Hmm what do I want to make? They all look really great. I'm super proud of you. I think I want to make the mixers. I've been wanting to make that for a while but not paper pieced. So yours will be perfect. I don't think I know of a more creative person than you! I'm always sitting with my mouth gaping open in awe when I see the new things you come up with! Everything is DIVINE! REally love everything! Heading to Spokane in a few weeks and getting to the store that always carries your fabrics. Congratulations on another successful line of fabric and patterns!! Oh me oh my....just love all of the patterns...must have the kitchen aid and the cherry table topper and well everything else...love doing the barn along. I get really excited every other Wednesday. Lori, I love everything! I am so going to make some colorful cracker jars just as soon as you post the how-to :) And love those dandelions, they are so beneficial. The world would be a better place if every yard had more dandelions! Another great fabric line! I have the Hexi and the Thimble Rulers...can't wait to try the Dresden. Love the Tulip pattern...oh, heck, I love it all!! Can't wait to see the rest. I believe I may be in love with the Mix it Up and tulip pots!!! Great new patterns and I love that print with the mixing bowls and spatulas!! Great stuff!! Oh, my goodness, Lori, I love all your new designs. They are so cute and clever and would make any kitchen a dream place to work (play). I want to make a bunch of things for my kitchen and to give as gifts. I love the canister wraps and the dish towels, but everything is just adorable. Never mind, I want it all...he he. I was already seeing most of these on Pinterest this morning. I knew without reading or clicking that these adorable creations were all you. When I just came across the canisters pin, I had to come over and leave you some sewing/crafting/blogging love! I will be watching for the tutorial. Don't know where to begin! They're all so cute and wonderful. You certainly are creative and the dandelions in your garden are even bigger than mine! You remain an inspiration. Love all of it and I hope you can share your source for the flour sack towels. I think Mixing It Up is my favorite but it was really difficult to choose! Your patterns and fabric are a perfect match. thanks for sharing. Bake Sale is such a pretty line. I especially love the canister set and the kitchen towels and I can't wait to see the cookie jar design. Another great collection! Wow, every project is beyond darling! I love the vintage style and bright colors. Very nice! Your Bake Sale fabric line is so cute. I'm looking forward the getting some of it. I like all of the small kitchen related projects, especially the cannister set and the mixer quilt. Thank you for all of your creative efforts. Love everything! The fabric, the patterns, the adorable quilt holder/model! Oh my!!! I am in quilty heaven right now after reading your blog!!! I don't remember ever wanting so many things so badly all at once. I love your patterns and fabric. everything is perfect, as usual. if i had to choose, canisters and cherry bake are my very favorites. well . . . and that giant dresden. and the towel loop on the apron . . .
Love them all! I need to make those towels! I have to say, everything you make is absolutely adorable!!! And your fabric makes me smile...aaaahhhh, it takes me back to a happy, simpler time, in the kitchen with my mom. I love the Blue Plate Special AND I can't wait to see how you made the kitchen canisters. You're definitely one of my favs!!! You are my favorite designer! And I love your fabrics too. Just yummy! Gotta have the mixers - I especially love those spatulas! And the tulips and the cherries are really cute, too. Lori, you are amazing. It seems that there are sew many events in the northwest and Midwest. Must be because the weather is so crappy and people are holed up for much of the year. That is my theory. Doesn't seem like we have that many events here in the Southeast. Would love to take your class, any class. Congratulations on your 'Bake Sale'...so pretty. I love the large dresden and your aprons are way cute. Keep up the inspiration and amazing energy! Oh.My.Goodness! I had to take a break about halfway down the post, to catch my breath...I'm sending all my bloggy love, with a bunch of bloggy drool. This fabric line is just so sweet, and the patterns show it off just right! I want to make soooo many things now. The canisters are the BEST, and I MUST do those! Cookie jar for me, please, and I can't WAIT for the lid tutorial. Pure genius, and the stuff I wish I could dream about. And that mixer on the quilt...fantabulous! Hurry, please, hurry on the patterns. I can't wait to see Bake Sale at my local quilt shoppe. So many must have designs. Can't wait to see all the new patterns too. Thanks for the fun sneak peaks. I love it all but I can't wait for the blue plate special! Love it! What a great line of fabrics ! I can't wait to see the rest. I have several of your patterns and fabrics! You are so talented and inspiring. You motivate me to work a Ne expand on my quilting. I love all your patterns and material. You always do such a fantastic job. This makes me want to renovate my kitchen NOW! My husband gets his workshop/garage first so that he can build the cabinets...but your new fabric and patterns may get me started on the decorating part...so cute and SO happy! You have been one busy woman. I love them all. Can't wait to see the new patterns. Lori these are just too cute. You have such good ideas to use your fabric line with. Can't wait to see the patterns. Wanna get all of 'em. WOW, you have been busy! I can't wait to see the Blue Plate Special and the Tulip Pot quilts! Love those sneaky peeks! The tulip row was my favorite on the row along you did for us. I LOVE my quilt that I made from that----so GLAD I followed along! I hope you have a restful rest of the week!!! Bake Sale is sensational - I can see it in my mailbox! Lori, you do such great design work! Seriously, I could sew all summer just working with the samples that you let us glimpse today! FUN! Your work makes me happy - and that's the best compliment of all. I love your Dresden Plate ruler. Can you tell me if your pattern appliques the plates onto the quilt or sets them in? Appreciate so much you sharing all your creative ideas. Such cute patterns. The aprons are my favorite, what a cute idea using the dish towel. Looking forward to using your cute patterns. Love your Bake Sale fabric and the projects! I especially can't wait for the Mix It Up quilt and I have to make those kitchen canisters. And the Cherry Bake quilt is awesome! They will be the hit of Spring Market! Beautiful! I love all of your projects, but I have to admit that your Dresden Plate is my favorite. Thanks for sharing. Wow, Lori, yet again another masterpiece with the new Bake Sale patterns! Love, love, love them. 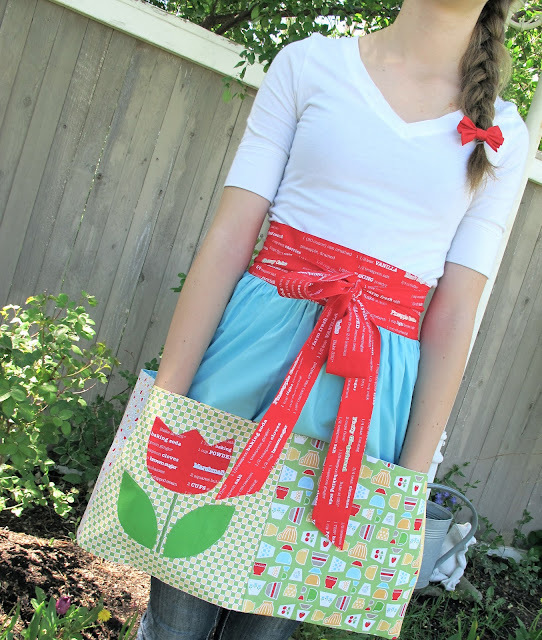 Just when I think you must have used up every creative thought in your pretty head, here is a combination of AMAZINGLY cute fabric and patterns Lori! These are all show stoppers! I love the things you design, and I love all of your fabrics. So much eye-candy in this blog post. Thank you! I'm sure you will get those patterns written and be able to play in your gardens soon. Everything you've designed with your adorable fabric is SEW cute--you are amazing!! Great Imagination on the canister set! And I love the aprons. I think I will be making some of those for Christmas gifts this year. Thanks for the inspiration. I love the aprons. Is the pattern still available? I also want the one for the canisters. Too cute. By the way - love the new fabrics and the Blue Plate special and Mixing it up patterns are cool! I also like the aprons with big pockets. I always need pockets and the loop for the towel is perfect - I always tuck one into the waistband and like the idea of a loop. I like it all!! Can't wait to buy some of that new fabric line along with some of your patterns and rulers. I really enjoy reading your blog. Everything is just so delicious !!! So many goodies to look forward to ! Your fabrics and designs are gorgeous.Congratulations! What wonderful, fun patterns to go with your gorgeous new fabric line! Live the mixers!!! OMG ~ I am so excited ~ I don't know what I like more ~ the fabric or waiting to see what you do with the fabric ~ Can't wait to get my hands on this line too! You are too wonderful! all your designs were great, but I think my favorite is the canisters. what a truly inspiring set of designs. 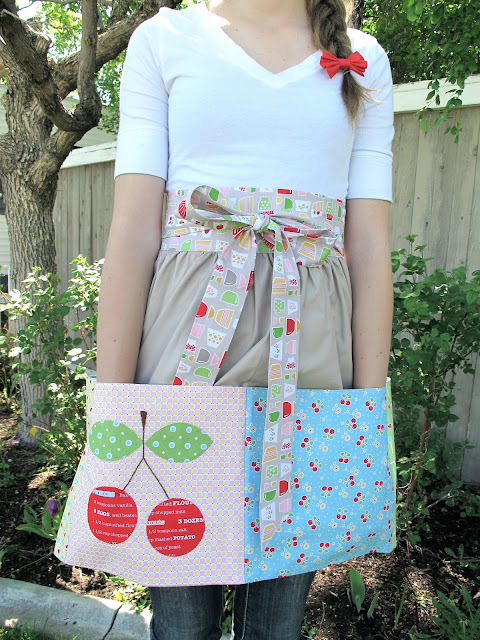 No worry - your aprons are more than adorable and I absolutely LOVE the mixer quilt. Very cute patterns! I have one request though. Please leave your dandelions for the bees! Dandelions are one of the best sources of nutrition for bees and since they are dying in record numbers (we lost 1/3 of all bee colonies in the US this winter) we need the dandelions! We need to embrace our dandelions! Besides if you don't spray them, the leaves make tasty additions to salads. Thank you so much for sharing your talents with all of us! Such beautiful creations...I love them all. I will take a bakers dozen please:0) Your Bake Sale fabric line is gorgeous and I really want to redo my kitchen and dress it in projects made from your cheerful fabric. I grew up with days of the week everything as well:0) I bought a days of the week set of undies for my grandson and grandaughter for Easter and stuffed a pair in little plastic eggs for thier egg hunt, Im sure they were expecting chocolate but it caused a lot of laughing and giggling:0) Chocolate bunnies also made surprise appearances. Thank you for sharing your creative genius with us and for all your hours put into the creative process, it really is appreciated and loved by all of us. Love it ALL of course! But especially the cute little pincushions in the tin molds, and the quilt with the mixers!! Seriously amazing Lori! I giggled right outloud for Blue Plate Special and sighed for Cherry Bake, but I absolutely need to make Mixing It Up to sit on a bench in my kitchen. Any chance you could design a cover with the cute mixer and spatula block to fit over my Kitchen Aid? Bake Sale is adorable! I want everything! Love your fabric line and can't wait for the patterns. You are AMAZING and so very creative! I know your fabrics are tops and some of my favorites, but your canister sleeves are the bomb with the knobs on top of the screw on lids. Genius! I am just so happy about your good fortune and I have watched all your tutes on ebay! You have and still are working so hard. Good luck with everything. So exciting! I am glad to see so many things we can do with this lovely fabric. I love it all. 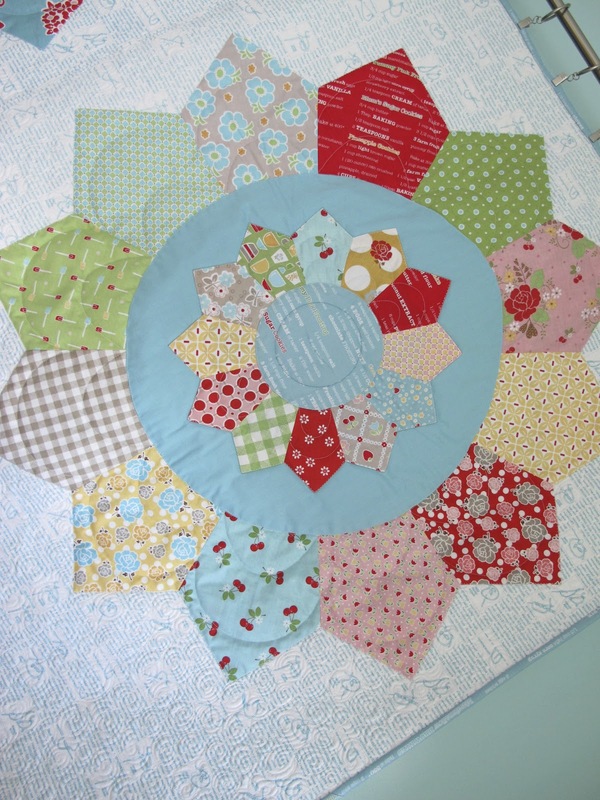 I super love the mixing it up quilt and the Dresden plate. You my friend, have made some spectacular creations. You do some pretty amazing things. I really love it all. 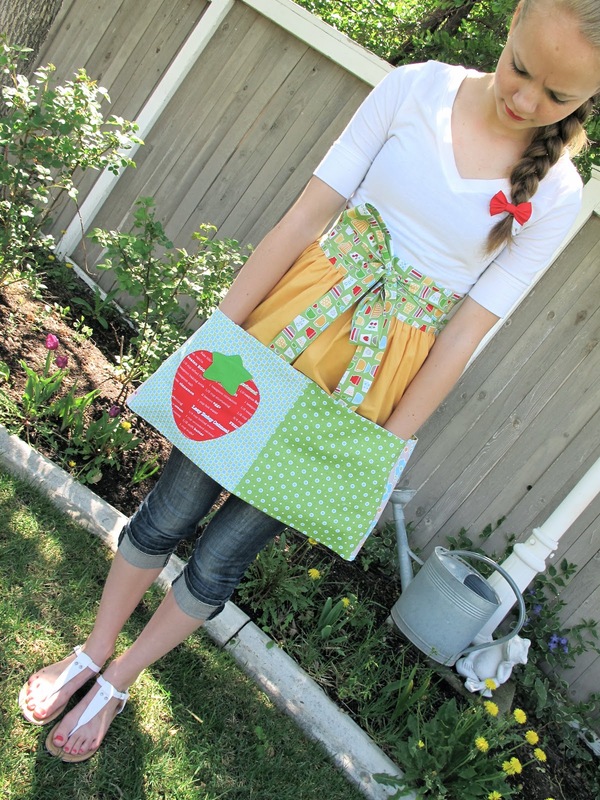 Who wouldn't love that perfect apron and the beautiful fabric. You made me especially drool at the mixing it up quilt and the dresden plates. You should feel proud, you did great! You're killing me! Everything is so irresistably adorable!! The aprons are just beautiful and the tab to hang a towel, genius. I always put my towel down and forget where I left it. Your work is spectacular! I just have to make 'mixing it up'. That is just what I need for my kitchen!! Plus the storage containers are a 'must'. Can't wait! I 'm in love with all of your projects and the fabric is perfect. To me it has a "vintage kitchen" feel to it, yet up to date & modern all at the same time. I love kitchen projects. I see myself planning for Christmas gifts for so many on my list! Well done, thanks for sharing. You are amazing! Cute patterns and great pictures, Lori. Good luck pattern writing, girl. Congratulations!...love the designs and projects. As usual, love them all! Especially interested in those canisters--how totally cute! Some lovely projects and fabrics here! I especially like the little cupcake pincushions - so cute! I just got 1/2 yards of this line delivered today (a little birthday present from me to me!). It is beyond adorable. PLEASE let me know if you need any pattern testers! I love your projects as much as the fabric! Wish you were here in Portland so I could say hello in person! I love it all! Just ordered a little bit of Bake Sale, and can't wait to make those mixers! I just finished a sewing machine from one of your older patterns, so much fun. :) It's over on flickr, you should start a group for all your patterns! LOVE all the new patterns !!! Several "must haves " and I think a little bit of bake sale is going to be my very next fabric purchase !!! Your Bake Sale is the cutest ever! Love your designs and patterns, I want them all! Congratulations on such a great collection. I can't get enough of your vintage...style! Oh baby! I want that mixer and spatula pattern! I can't wait until it is ready!!!! I love love love the canisters! I have these canisters in my sewing space holding different things and I even spray painted the lids like you and I even finished them off with a glass handle like you!! !isnt that crazy! Anyways mine are not as cute tho cuz they don't have the cute "flour , sugar" labels on them and now that I see that I must do it! I cannot wait for the pattern so I can make them to wrap around my jars. It would be fun if you added one that said "cookies" on it too :). Thanks for all your awesome inspiration! OLÁ!! TECIDOS EM SUAS MÃOS TUDO DE BOM EM AMIGA,PARABÉNS POR SER ESTAR ARTESÃ MARAVILHOSA NO MUNDO DOS TECIDOS.FELIZ NATAL A TODOS POR AI.BEIJO.VALÉRIA.(BRASIL). I can't wait!! You are so talented and I love your stuff!